Ever since a year ago, Giuseppe and I have been constantly working together on projects of different kinds; comprising plans for future collaborations, critical exchange of ideas and exhibitions. The latter, in particular, encompasses FRAGILE, i.e. a show that opened in October 2014 at Galleria Upp in Venice. On that occasion, the display was centred on DRON project: a work developing as a series and revealing Giuseppe’s focus on anthropological elements and notions such as memory, history and time. The following interview is the result of our conversations and incessant dialogue on his research and mine or, in other words, on art and its context. Miriam La Rosa: One of the key points of your research is the autobiographical component. Your works develop as a consequence of a reflection on the context that surrounds you and in a strong relationship with your origins; be they meant as places, people or facts. DRON project is an evident example in this regard. The title is the reverse of the Italian word for north, ‘nord’; symbol of a geographical convention opposed to the south, where you (as well as me) are from. This word, like in a change of route, takes a different aspect and, consequently, a different meaning. The first work of the project is, in fact, a compass that, with the name of DRON 0, marks the beginning of a new exploratory path based on the meaning of willpower. This is able to initiate a serial mechanism, i.e. a succession of works intended to investigate notions of time and memory. DRON 3, DRON 5, DRON 39, DRON 24 and DRON 8 are, respectively: a heater and a fan in contraposition; a series of spheres and tablets composed of your own hair; spotlights displayed in a circular way; a performance and a clock that goes backwards. What is the connection between the works and the numeric cataloguing? How does the passage from one ring (DRON) – and medium – to the other happen, in this chronological chain? Giuseppe Lana: In DRON project the works have developed through different ways of thinking, as theorems with their postulates and paradoxes. This project is not made to look for scientific solutions, but to simply give order to disorder. The relationship between the works and the numbers is not casual. The latter in fact belongs to the work in an intrinsic way and they are similar to codes, i.e. they do not serve only to catalogue the creative process. At the base of each work there is data gathered from the everyday and then developed throughout a diversity of mediums, without underestimating means such as painting, sculpture, photography or otherwise. I have attempted to make visible themes such as space, time, balance and memory, decoding them into works and numbers without any pretention of absoluteness. DRON 0 is, therefore, the starting point, the beginning of every deductive theory. Then, the work went on by itself, as a consequence of thoughts and influences taken from previous works, almost to represent a need of dialogue, in one chapter after another. MLR: In some carriages of the metro in London, I often happen to mismatch the pink of the “Hammersmith and City line” for orange. Then, I convince myself that it is always pink, of a different tone, due to the time passing by, which wears out, modifies and consumes; colours and things as well as human beings. Piuttosto grigio è quasi soggettivo! is the title of another work from 2012 that analyses time from a pictorial perspective. “People perceive colours in different ways” you told me some time ago, “because of the light and the environment in which the perception comes to be”. This work incorporates your entire journey with painting. In which way, exactly? GL: With memory, our senses attenuate themselves in time and colours undergo to chromatic changes; the latter flag, lose their tone and sometimes disappear. Piuttosto grigio è quasi soggettivo! 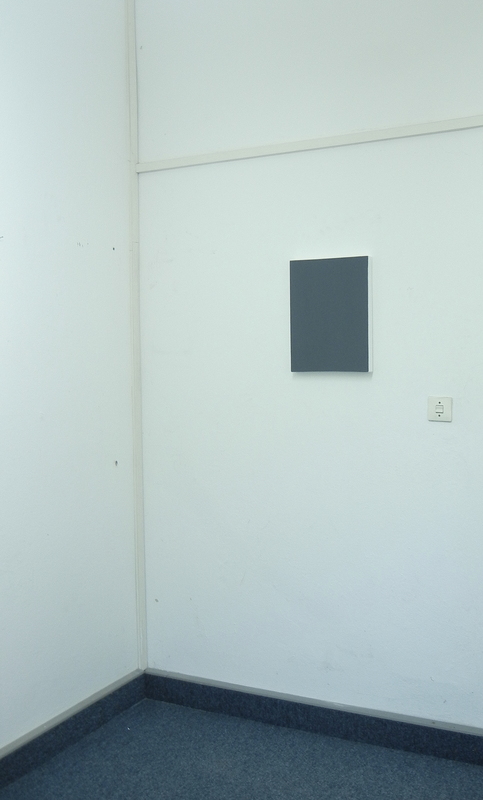 is a work that investigates the subjectivity of what we perceive. The project contains a temporal representation of my research within the colour; almost as if I had compressed physically tens of works into one. I have attempted to overlap different files between themselves, until cancelling the image itself, so that the composition could result completely abstract. Chemically, I have realised this work by mixing all the colours present in my studio; colours collected over the years, which I have utilised from my first works in the 1990’s, for almost a decade. In this way I have tried to create a temporal relationship between my first and last pictorial experiences. By containing years of work in a sole painting, in a sole unique, personal and unrepeatable colour, the whole becomes one. MLR: “di sbieco… “ is a work of 2011 that, once more, carries a strong autobiographical reference. 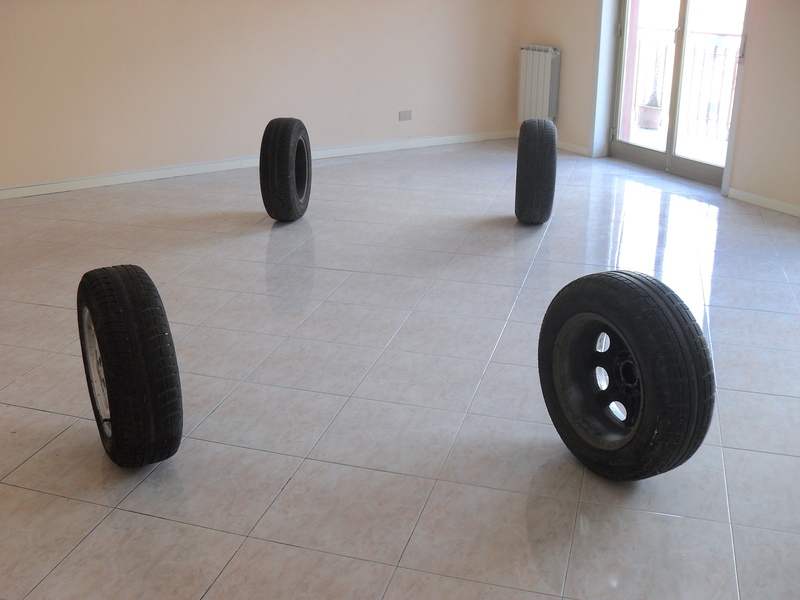 The four tilted tyres belonged to your old car, which was destroyed after an accident. What is the relationship of this work with time? GL: In my practice, both chance and error are permanent features, something unpredictable and often uncontrollable. 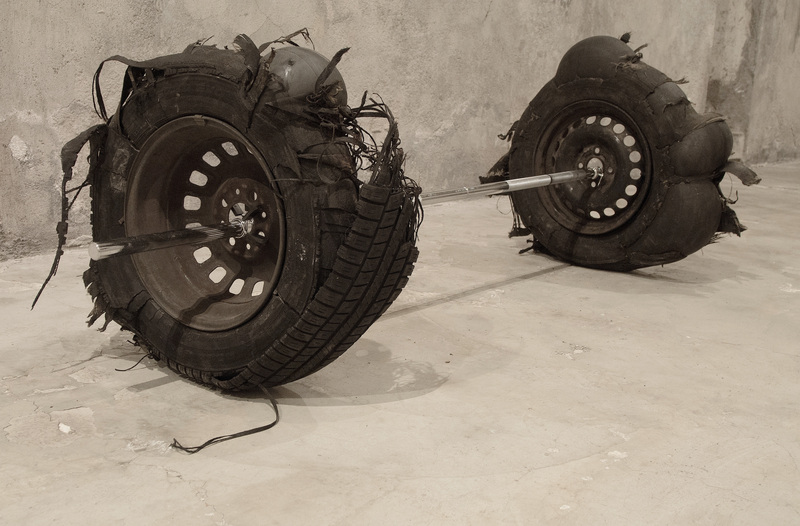 In this specific work, the transitory situation of the tyres reminds to a dichotomy between what something was – as an integer corps – and what it represents through the void of its epiphany. A peculiarity of my research is that of constantly overturning the prospective, but when I believe that I have defined a point, I realise that I am actually far away from what I wanted to delineate. MLR: On a plane from Venice to London, you told me the story of Paolo e Francesca: the story of an interrupted love, then eternally remembered. In this instance, though, despite the personal reference, the work finds its origin in a mediated autobiographical fact. In other words, the inspiration has come through the intervention of what I like to call a helper. 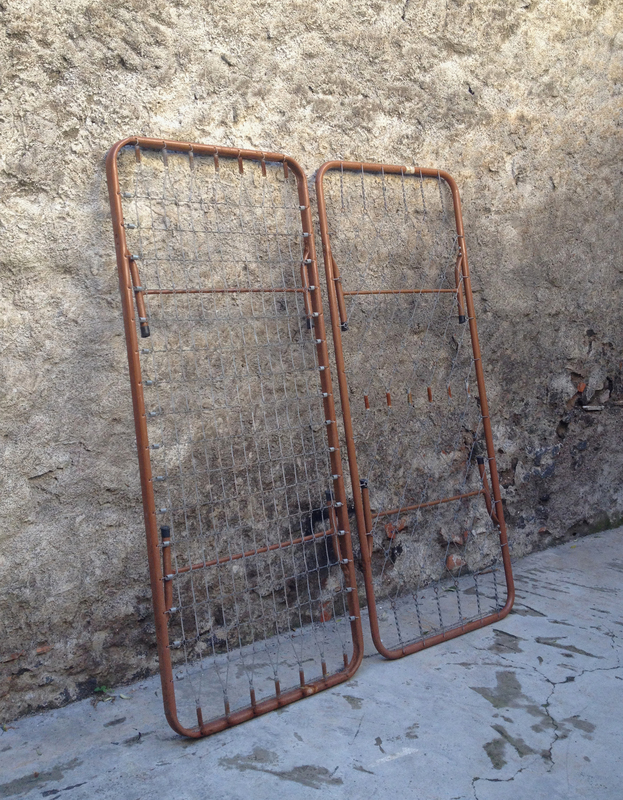 This one, in the specific case of Paolo e Francesca is a woman living close to your studio in Catania, Sicily, that one day decided to give you her old bed’s box springs to “make a good use of them”. The presence of and the confrontation with these helpers is a constant element of your practice; characters belonging to your daily life, that often lay the basis for the development of a story. In which way do you build these relationships? What is the importance of these interactions for your research? GL: I was born and raised in a working-class district in Catania, where some years ago I also got my studio, giving birth to an independent project in support and development of artists of my generation. The exhibition space, as well as my studio, are frequently populated by both artists and neighbours; i.e. people triggered by my particular activity. The excuse of a coffee and a chat has thus contributed to the development of a strong relationship between my working process and their stories. There are many anecdotes related to the neighbourhood and the relationship of each one of this people with art, such as Uncle Pietro and is super 8 film, realised in the 1970’s and considered so valuable by my opinion to be displayed in Artissima Lido in Turin, in 2012. In the specific case of Paolo e Francesca, I found inspiration from the stories of my neighbour Aunt Pippa; an old woman, widowed for many years, who lived in my same building and that gave me the bed’s box springs I used to make the work. I strongly believe in this endless union and human exchange. MLR: Your confrontation with the notion of locality and the issues related to it is not expressed only through people, but also through a strong relationship with history: that of Sicily and Italy, in particular. In this respect, I can think of two works, both of them with a political focus. The first one, Externum Historia, was realised during your residency at FARM CULTURAL PARK in Favara, in 2011. 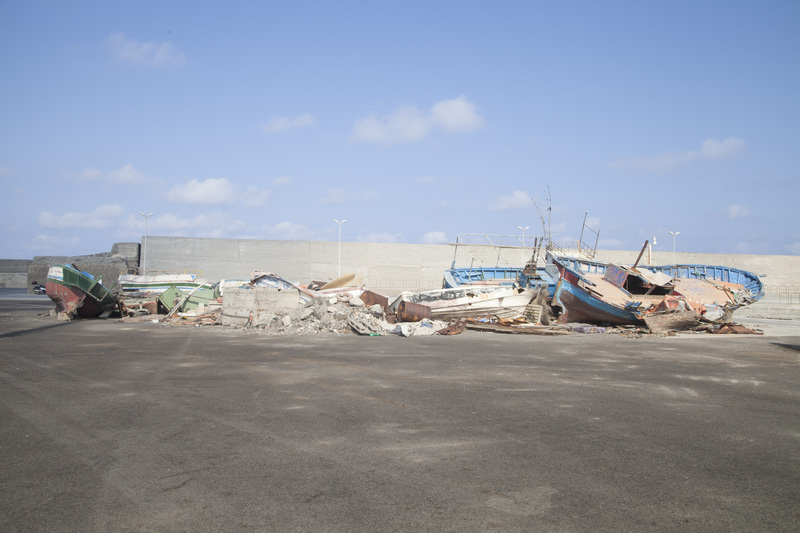 It tells the story of the SS640: a street that functions as a main transportation link in the island and that, unfortunately, has become object of the murder of the judges Antonino Saetta and Rosario Livatino, by the local Mafia. The result is a series of asphalt plates from the SS640, piled up to form a cubic sculpture. The cubic meter is the unit used to measure volume and space, metaphorically, also the landscape. Through your intervention, a cubic meter of asphalt has become a monument to the history of this Italian town, today flanked by a bigger street, i.e. symbol of the development of the territory. The second work i.e. Art. 9 Costituzione Italiana, from 2013, takes instead the shape of a sarcophagus made of polystyrene, portraying a view of the city of Pompeii. The article says: “The Republic promotes the development of culture and scientific and technical research. It preserves the landscapes and the historical and artistic heritage of the Nation”. This is a spot-on irony, in reference to the recent happenings, regarding the missed preservation of the archaeological site of Pompeii. Both works denounce historical-political facts but, at the same time, want to suggest a glimmer of hope for the future. In this regard, do you think that your practice performs a function of activism, other than political expression and denounce? GL: As an artist, I believe that my work is not politically lined up, but I cannot deny my personal involvement with the issues that surround me. I have lived in Sicily during the years when the Mafia showed its power through cruel actions, leaving me with strong images and feelings. I still ask myself what my responsibility is, as both person and artist, and how this can eventually be beneficial for the community. I consider Externum Historia and Art. 9 Costituzione Italiana works that aim to create awareness, rather than to denounce. This awareness is the same one that today brings me outside of Italy, giving me the chance to focus deeply on both the limits and opportunities of my own country. MLR: Talking about your most recent works, Ovidio is a project of 2014 that investigates issues of aesthetics and identity. The main theme is metamorphosis, with the goal of facing diversity from a visual and conceptual point of view. Where does the inspiration come from? To what type of autobiographical transition does the project refer, this time? GL: After years of work mainly focused on DRON, my exigencies are bringing me towards a new direction; a cyclic and natural change. I find the wheel complete on each point of view. For me, it is an archaic symbol, still strongly innovative, that, changing its function, has given us the possibility of evolving. The wheel has been present in my works numerous times. There is a strict analogy with “di sbieco…”, i.e. a work that I have realised previously and that has given me the chance to study and appreciate its expressive strength. Similarly, Ovidio offers me the opportunity to deepen the relationship between aesthetic and identity; a very current concept that often brings us far away from what is different than routine. MLR: Transformation and fluidity are guiding terms in your entire research. This is, in fact, the case of a work in progress started some time ago, linked to the sea and to the political facts related to immigration. The project includes the presence of rubber boats: a material that recalls, for composition and characteristics, flexibility and resistance as well as use and precariousness. In which way do these elements reflect in the story you want to tell? GL: A couple of years ago, I got invited to take part in a residency programme in Pantelleria, where the themes were immigration, journey and mankind. In Pantelleria, as in other Sicilian islands, there are constant disembarkations from Africa on crumbling boats, imbued with stories of human desperation. Visually, the thing that comes clearly to the eye is the inhuman condition of the boats these people are forced to travel on; old sea wrecks that, once sequestered by the authorities, stay docked waiting for demolition. The attempt of this work is that of sensitising the social and political consciousness, changing perceptions, suggesting rebirth where often there is death and promoting a civil responsibility towards human nature with a gesture. The project relates to the transformation of old boats used by the clandestine immigrants during their journeys of hope; boats that tell the story of human catastrophes reconverted into monuments to life.